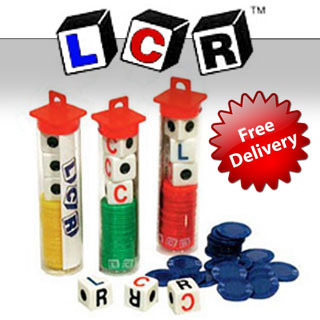 LCR, also known as "Left, Center, Right," is a dice game that is easy to learn and fun for three or more players. Three specialty marked cubes are rolled to determine where players distribute their chips as they compete to keep as many of their chips as they can. The last player with chips is the winner and wins the center pot. Hours of fun for the whole family. The kit contains three LCR dice, a tumbler to shake and roll them, and poker-style chips (although any other type of markers can be substituted). Each die is marked with an L, C , R and dots, representing the action to be taken for each roll. Since the game involves very little strategy, first-timers have just as much chance of winning as veterans. 1.Sit with the other players in a circle. Provide three chips for each player. 2.Roll three dice and perform the action based on the result. "L" means pass one chip to the player on your left, "C" means place one chip in the centre pot, and "R" means pass one chip to the player on your right. Therefore, if the dice come up L, L, and C, give two chips to the player on your left and put one in the centre pot. If a "dot" comes up, you retain that chip. For example, if the dice come up, R, dot and dot, pass one chip to the player on your right and keep the other two. 3. Pass the dice to the player on your left. He will roll one die for every chip in his possession up to three dice. If he has one chip, he will roll one die. For two chips, he will roll two dice. If he has four or more chips, he will only roll three dice. He will pass or retain his chips based on the results of the roll. If a person does not have any chips in front of him, he does not roll any dice. He is not eliminated since it is still possible for the person next to him to pass him chips and get him back in the game. 4. Repeat this process until only one person is left with chips in front of him. This person wins the game.